The other day while I was in my Catholic Journaling Bible, I decided I’m was going to make the first verse of Isaiah Chapter 60 my good morning battle cry, “Arise! Shine, for your light has come, the glory of the Lord has dawned upon you.” Wow! Not only a morning battle cry but how about one of my daily affirmations as well?! Now let’s break that good morning love-fest down. In Isaiah 60:1 it states, “Arise for your light has come…” And if you flip all the way over to Ephesians 5:14, it states, “Awake, O sleeper, and arise from the dead, and Christ will give you light.” Which made me think of a die cut in the Illustrated Faith Bible Journaling Kit that read, “Made to shine.” Welcome to my mind, lol! And tying this all together…Isaiah encourages us to “rise and shine” because the Lord has dawned on us. While Philippians instructs us to do everything without grumbling and complaining so that we may be blameless and innocent children of God in a perverse world where we will shine like stars in the world. Did you follow all that? Let me tell you, I think one of the easiest ways to follow the ideas of the Scriptures is to pay close attention to connecting words: because, so that, where. In other verses these words could be: therefore, then, instead of, for, and, etc. 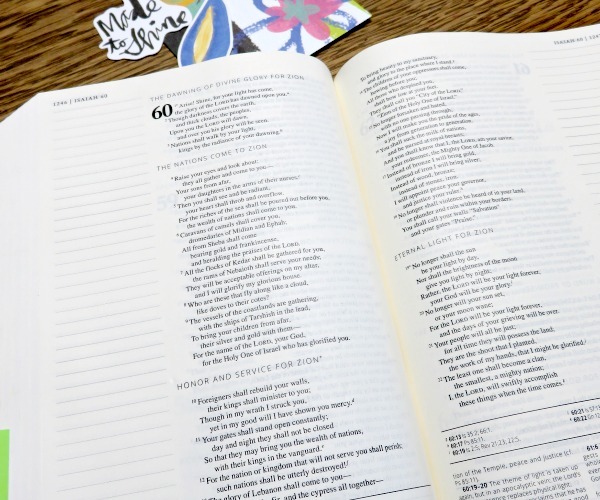 Finally, let me tell you all the details about how I journaled this page in my Catholic Journaling Bible from Blessed is She. I borrowed some of my children’s very used, cheap watercolors and dug through all the craft boxes until I found some type of watercolor brush. I think I bought these brushes in a multipack for a couple of bucks. Next, I found a small cup to fill with water and grabbed a couple of paper towels. I cleared a spot at the table so my Bible wouldn’t be resting in a sticky, syrupy spot because one of my children, who shall remain unnamed, didn’t wipe that spot down after breakfast. I couldn’t find a glue stick so I asked around the house and apparently, another child who will remain unnamed, hordes them, so I asked pretty please if I could borrow one for just a minute. I got my brush pretty wet and dipped it into the blue. But the bue wouldn’t work so I dipped it into the purple watercolor. 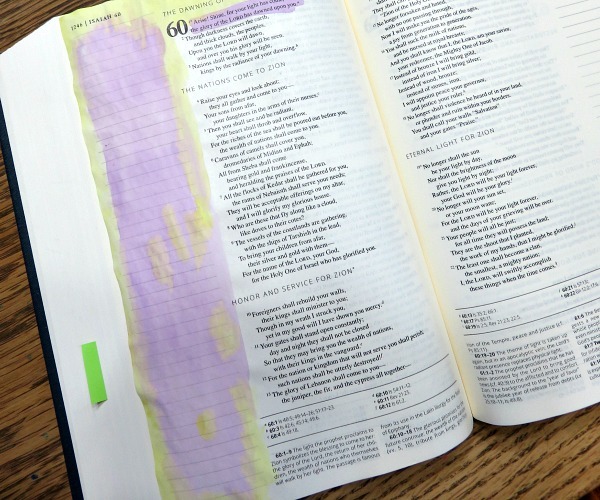 I highlighted Isaiah 60:1 with the purple watercolor and then spread it semi-evenly in the wide Bible Journaling margin. I dabbed it with a paper towel and then dipped my brush into the yellow watercolor and filled in the edges and some sparse spots in the middle. I dabbed that with a paper towel and then went and found my blow dryer for my hair, which I never use for my hair, and dried the page because I was too impatient to wait for it to dry. 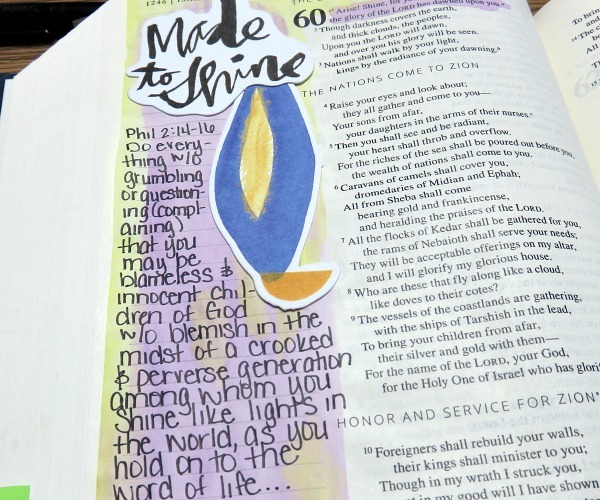 Once I finished drying my page, I used the glue stick on the back of my Illustrated Faith die cuts–one says “Made to Shine” and the other is a candle. I glued them on top of the dry watercolor. Once I glued them down and they were nice and dry, I questioned if I glued the candle right side up and then moved on quickly because even if it’s upside down, too late now! I outlined the die cuts with my sharpie and then wrote my companion verse from Philippians in the margin. 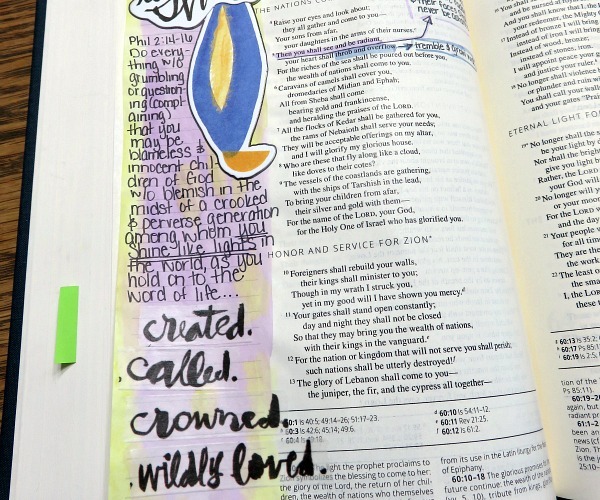 Then I cross-referenced a couple of other verses on the other side and used my favorite highlighters in the whole blessed world to keep them neatly organized. Finally, I tore a strip off the Illustrated Faith washi that included all the words, “created. called. crowned. wildly loved.” and tore them into individual pieces and stacked them at the bottom of the page. Lastly, I dated the page. I included those detailed instructions to prove, anyone can do this. You don’t need expensive supplies or be extremely creative. 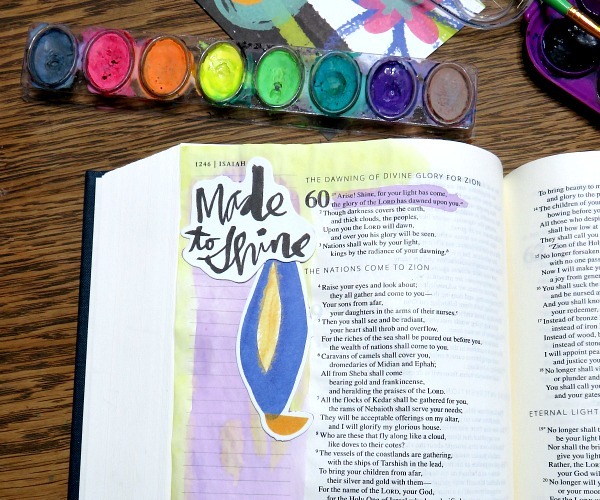 I combined two styles of Bible Journaling–art journaling and verse mapping. The Illustrated Faith supplies I used can all be found at DaySpring. As an added bonus, if you are an Ebates member (totally free to sign up for) you can earn 6.5% cash back on your DaySpring purchase! 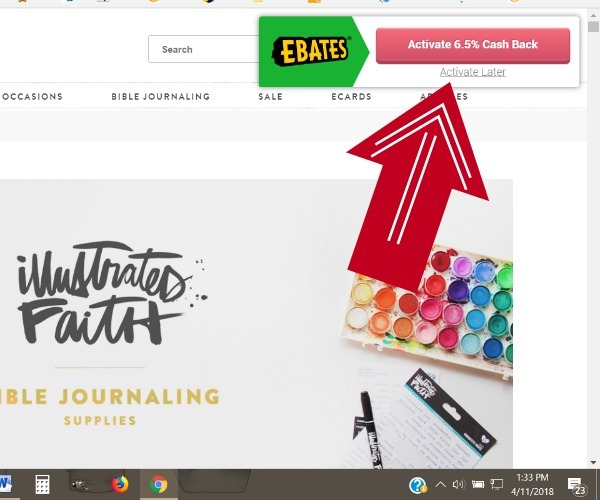 * If you have the Ebates bookmarklet tool for Chrome installed, a little popup window will appear in the upper right hand corner of the DaySpring page telling you to active the cash back, easy peasy. 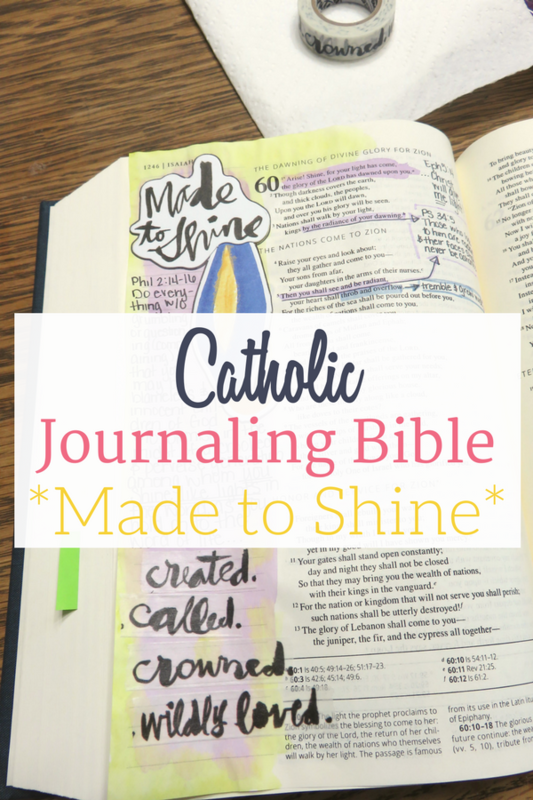 Visit my Catholic Journaling Bible page for more posts about Catholic Bible Journaling. I just bought the Catholic Journaling Bible and I love it. You do have very encouraging statements that tell us to go for it. I like how you cross referenced your study with other similar Bible verses. Thank you. I’m going to try that. I really wish I had the courage to do water color in my Bible, because I love the way it looks. Loved this post! Your process of study and journaling made me feel like I can do this too. Thanks so much for the encouragement! You are very welcome. And yes, you can totally do this!